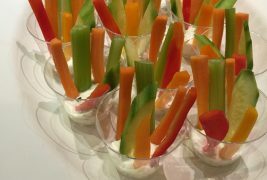 Individual veggie cups make a nice presentation and means you can double dip all you want. Use the short, clear plastic cups found at the supermarket. Present the finished cups on a nice, flat platter. If you haven’t yet tried the over-sized Cape White turnips, you are in for a treat. Yes, even a turnip can taste great, especially this very special heirloom variety. These Cape Whites are creamy and sweet-tasting, more flavorful than typical purple top turnips. Find them locally on Martha’s Vineyard at Morning Glory Farm or at Cape Cod and Southeastern area winter farmers markets. The heirloom Macomber turnips are very similar. Try cooking as you would mashed potatoes, but you won’t need the cream, or roasting in the oven with olive oil, salt and pepper. 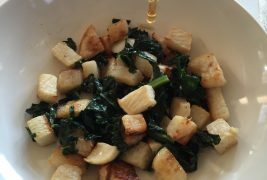 This recipe sautes the turnip, adding in some kale, and drizzling over bit of honey over both. Simple, and delicious. Read more about this fall root vegetable, here. Elegant and delicious, this salad will win raves. The method for roasting canned artichoke hearts to rekindle their flavor was suggested by a chef and friend, Tina Miller. 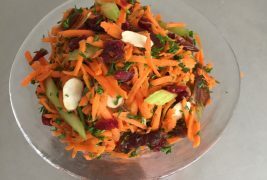 This salad tastes and looks best on the day it’s made. The size of the “adorable” mini butternuts — four to five inches in length – compared with regular-sized butternuts of 10 or 11 inches — is actually perfect, making it an easy side for home cooks. Split down the middle and roasted, the mini halves fit neatly and easily on the plate with fall dishes like meatloaf, coq au vin, or Vineyard scallops, and add that beautiful rich burnt orange color as well. Their flavor is sweet and nutty. At this time of year, there are some superb spring greens to substitute for lettuce to make delicious, healthy fresh spring rolls. 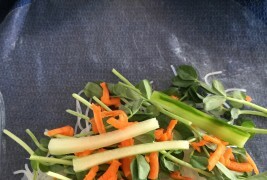 Last week, I used Caitlin’s pea shoots from Mermaid Farm – so good! In the next few weeks, I’ll be picking watercress – and that make another great addition, as many locals here can attest to. Give it a try. Kids love them too. 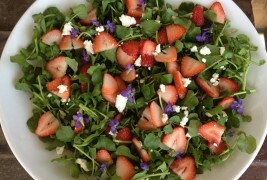 So simple, with just three ingredients – but yet beautiful and tasty – a spring salad to celebrate. At this time of year, check your yard for the tiny, edible violet flowers to make a contrasting garnish. The salmon and asparagus are roasted on the same sheet pan to make an easy weeknight meal or casual dinner with friends during asparagus season. 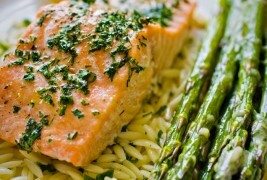 Serve this with orzo dressed in a little butter and some of the leftover herbs, or boiled new potatoes. 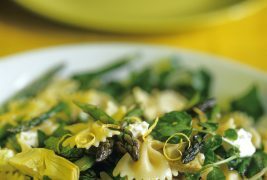 This is an easy, fast recipe for spring asparagus – which soon will be available from Morning Glory Farm on the island, as well as from a few growers selling at the West Tisbury Farmers Market when it opens later this spring. The eggs, imported Parmesan reggiano, and a bit of pasta water create a luscious, creamy sauce that coats the pasta and vegetables. Cut the asparagus on the diagonal to make the dish look prettier. 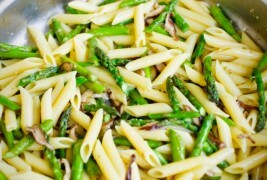 Prep the asparagus and mushrooms in advance of cooking the pasta, so the timing of the dish works. For other recipes with asparagus, check out the asparagus article I wrote for Martha’s Vineyard Magazine which features Morning Glory Farm and tips for using asparagus. 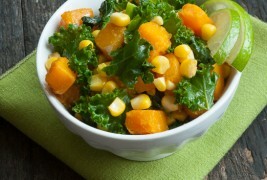 Fall is a perfect time to enjoy kale, as well as butternut squash and the tail end of summer corn. 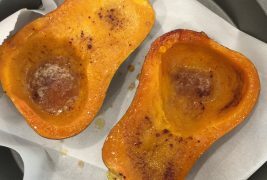 This recipe shows a nice technique for cooking both squash and kale. Fresh corn removed from the cob gives it a wonderful crunch.